Cascading tabletop or hanging basket. Native to the monsoon tropics of Malaysia. Here they are tropical climbers, creeping by rootlets, attaching to tree trunks to climb upwards through the jungle in search of light. Cascading tabletop or hanging basket. Native to the monsoon tropics of Malaysia. Here they are tropical climbers, creeping by rootlets, attaching to tree trunks to climb upwards through the jungle in search of light. The plant has two leaf forms. In their juvenile, state the heart-shaped, glossy, marbled leaves are small; two to four inches in length. This is the version we see in interiorscapes. Growing wild in the jungles the highly variegated leaves will easily reach over two feet across becoming lobed like the Monstera at maturity. Survive in low light. Prefer medium to bright indirect light. They will remain alive in low light for a remarkably long period of time if water levels are kept low. In very low light, growth will be slow. Any new growth will have less variegation and be somewhat smaller. On the other hand, in very high light the leaves can tend to bleach out or even burn. In a sunny window, they will have colorful, more prolific leaves, grow faster and need more water, fertilizer and soil added on a regular basis. They prefer to not have soggy roots and do best when the soil mix is allowed to become moderately dry between watering. The hole or divot in the soil, which occurs in older pothos, is a cause of plant stress. This lack of soil can cause the plant to dry out too much between watering, causing soluble salts to rise to toxic levels. The result will be brown leaf tips and margins, sometimes with a yellow border. This hole should be filled in with some fresh soil to keep the plant looking its best. 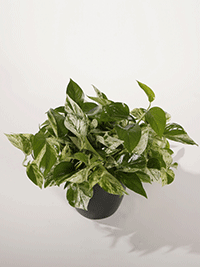 Pothos can survive in the same grow pot, with a shrinking soil mass, for many years. The only noticeable result will be less healthy-looking leaves (more stem). Pothos will blacken and turn into mush when temperatures approach freezing. Do not set them in a cold van unprotected unless you want the leaf tips to be black by the time you reach your account. 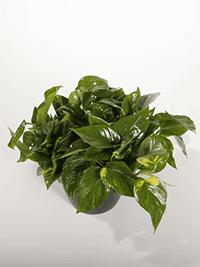 Pothos will also react negatively to cold soil in planter beds and cold tap water. These conditions will frequently cause the plant to rot off whole stems. Newly installed, slightly under-rooted plants seem to be the most susceptible to die-off from too cool (or too wet) conditions. Epipremnums thrive in warm, evenly heated temperatures in medium to bright indirect light. They prefer to not have soggy roots and do best when the soil mix is allowed to become moderately dry between waterings. Their great ability to adapt to conditions allow them to survive in less than ideal conditions. 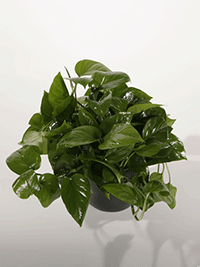 Pothos that aren’t pruned on a regular basis will get weak and thin especially near the pot. To cover that hole you may be tempted to wind the vine back over itself. This unprofessional method ensures eventual plant replacement because as the vine grows longer and is more wound around on itself, more stem and less leaves are visible. Pothos are well loved by mealybug, who hang out in the newly emerging leaves, on the under sides of mature leaves and in the soil. A plant that is stressed will become an especially favorite one for mealybug, or even occasional scale or spider and Cyclamen mites.